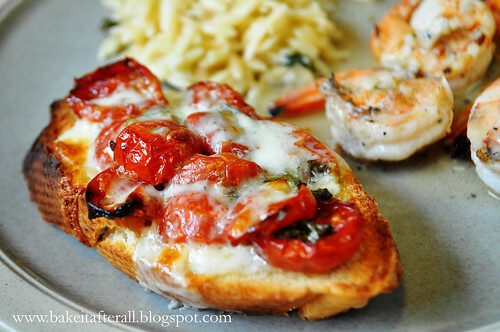 One of my favorite appetizers is this Double Tomato Bruschetta. It combines fresh and sun-dried tomatoes with the usual bruschetta ingredients and is topped with mozzarella cheese prior to baking. When I had some leftover Oven-Dried Tomatoes in the fridge, I decided to turn them into bruschetta. The result was amazing! We served it with Parmesan Basil Orzo and Grilled Shrimp. Delicious! 1. In a large bowl, combine the tomatoes, garlic, olive oil, vinegar, basil, salt, and pepper. Allow the mixture to sit for 10 minutes. 2. Meanwhile, cut the baguette into 3/4-inch slices. On a jelly roll pan covered in foil, drizzle olive oil and spread evenly with a pastry brush. Place the baguette slices on top, then drizzled them with olive oil and spread evenly with a pastry brush. 3. Broil the bread slices until crispy, turning halfway through (a few minutes on each side- watch closely as things can burn quickly under the broiler). 4. Using a slotted spoon to leave behind excess liquid, divide the tomato mixture evenly over the baguette slices. Top the slices with mozzarella cheese.